Adult Indianmeal moths are not responsible for damage to stored products, but the larvae cause extensive damage with their feces and webbings. Adults are slightly attracted to light. Adults don’t cause damage; however, larvae can produce an abundance of feces and webbing while consuming the most nutritious components of a product. Eventually, the product will become moldy and rotten and is unfit for consumption. Wings are pale gray with outer two-thirds colored reddish brown with a coppery luster. Adults, with wings spread, measure 5/8-3/4 inch (16-20 millimeters). Wings are pale gray with outer two-thirds colored reddish brown with a coppery luster. Grains and grain products, dried fruits and vegetables, seeds, nuts and nut products, chocolate and nut candy products, dry pet food, bird seed, animal feed, and dried flowers. Females lay 100-400 eggs, singly or in small groups, on food materials, within one to 18 days. Once hatched, larvae burrow into food. Larval period lasts 13-288 days depending on temperature and available food. There can be four to six generations per year, with the life cycle ranging from 25-135 days. 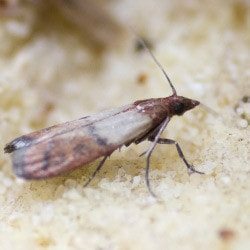 The Indianmeal moth is so widespread outdoors and indoors that stored food products must always be protected from infestation. Control of this pest isn’t as challenging as preventing an infestation.